Uses: Before and After, Church, Fellowship Hall, Religious, Sunday School Colors: Red/Mauve Lengths: 9 panel 16'-9" Heights: 6'-0"
Looking for a room divider to fit your color scheme while providing the privacy you desire? 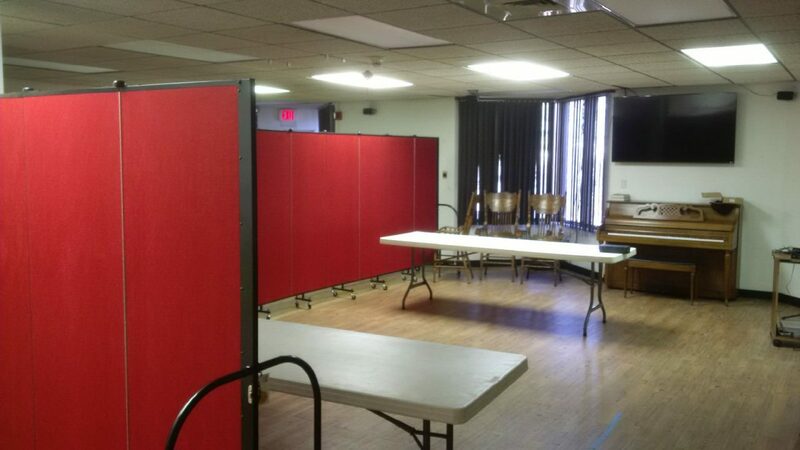 Screenflex Portable Room Dividers are available in 38 colors and 36 sizes to fit your needs. Choose from a variety of fabric and vinyl options to create the room divider that best coordinates with your space. These portable room dividers roll on self-leveling caster wheels for easy use in Sunday schools, atriums, hallways, multipurpose rooms, chapels or the narthex. Our 6 6-foot room divider roll through any standard doorway. Need to create a bulletin board? Feel free to pin, staple and tack items onto the units without damaging the fabric. Your facility will love the diversity of the units.